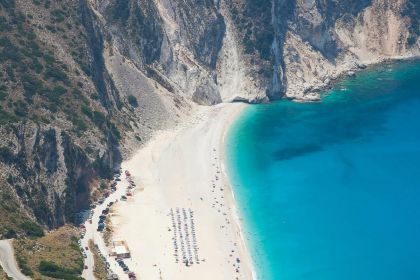 As the biggest of the Ionian islands, Kefalonia is a must-see Greek holiday destination. You’ll be rewarded with rich sapphire-coloured waters, iconic beaches, intriguing caves, remote monasteries, the aroma of oleanders, and… much, much more. 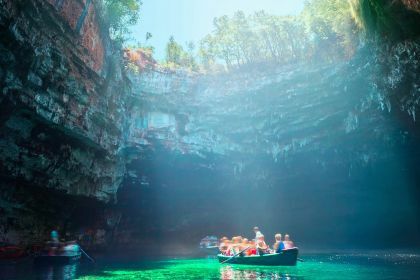 Characterised by an indented coastline, limestone cliffs, sandy coves and strips of white sand, Kefalonia is tailormade for an idyllic yachting vacation itinerary. Many beaches are only accessible on foot or via narrow twisting roads — and, of course, by yacht. There is no shortage of convenient and scenic anchorages, which will open the door to the charms of this Ionian paradise. Tap into your inner thrill-seeker and explore Mount Aenos. Its wild habitat will quickly help you shake off the shackles of stressful city life. As the only national park situated on a Greek Island, and with an elevation of 5000 feet, you’ll feel like you’re walking on clouds. Admire the exquisite Greek fir and black pine forests and coastal views that stretch on forever. 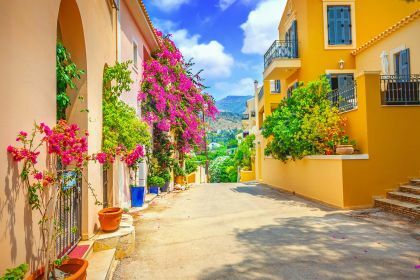 The rebuilt capital, Argostoli — destroyed in an earthquake in the 1950s — lacks some of the atmospheric charm of older Greek island villages but it more than makes up for it with its bustling shops, cafes, tavernas and working harbour. The tiled waterfront promenade, the pedestrian Drapano bridge, the fascinating caretta-caretta turtles feeding at the nearby Koutavos Lagoon… all contribute to making Argostoli a truly enjoyable town in which to wile away the hours. 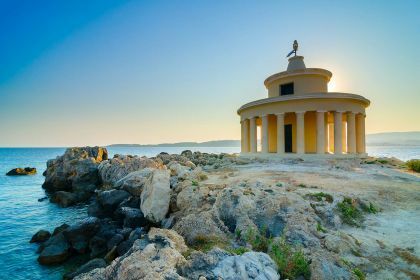 History aficionados can visit the Focas Kosmetatos Foundation, a small museum dedicated to the social and cultural history of Kefalonia housed in one of the few buildings that survived the earthquake. There is also an Archaeological Museum, which was built after the earthquake. 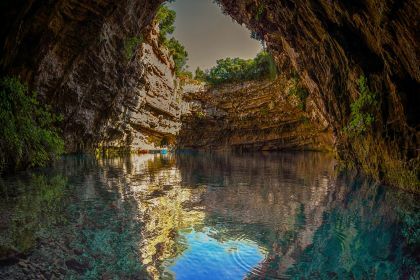 Don’t miss out either on the Melissani and Drogarati caves. Of course being a modern town, Argostoli has a collection of some top-notch restaurants and tavernas, suiting the most discerning palate. And on the island as a whole, there is a staggering array of fine-dining venues and authentic Greek and Mediterranean eateries. Try the Katavothres Club Restaurant in Argostoli for its spinach pies, cured steaks, squid dishes and strawberry salads. The Olive Lounge, in Lourdas in the south, also serves scrumptious cuisine, as does the Apostolis Taverna, in Skala in the south-east. The centre of Argostoli consist of a large square, the Platia Vallianou, which buzzes with cafes and bars. If you continue up north to the pedestrianised Leoforos Vassileos Giorgiou V (King George V Ave), there are also plenty of bars, cocktail lounges and nightclubs. Recommended options include Le Sapin Noir, Baroque Le Bistrot, Katavothres Club-Restaurant, Bee's Knees The Bar, Bass Club. 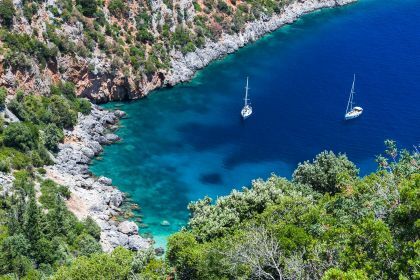 Insider tip Many yachting vacationers gather in Fiskardo, Kefalonia’s most northern port. This village miraculously survived the 1953 earthquake, so you can admire its exquisite Venetian buildings dating back to the 18th century while mingling with a cosmopolitan, well-travelled group of like-minded people.